I have some extra pars from my wrangler that I do not need. 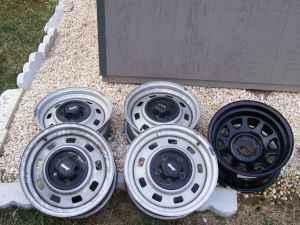 Pic 1- Set of jeep wrangler factory rims. $40 I will also sell this black rim sepeartly if someone just needs it. I also have a driver side upper door window. The window has a cut in it, but the frame is in good shape. If interested let me know. Feel free to call me at 443-907-8108 or email me with any questions of want to buys! !